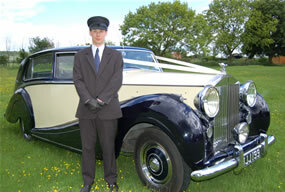 This beautiful Rolls Royce Silver Wraith was built in 1951 and is a great choice of wedding cars for hire. It is one of the last coachbuilt Rolls Royce’s and is exquisitely finished in Midnight Blue and Ivory with a luxury interior of blue leather seats and burr walnut fittings. Features of the rear compartment include picnic tables, footstools, mood lighting and electric division between passengers and chauffeur. When new this car featured at the 1951 Earls Court Motor Show as the top of the range Rolls Royce. 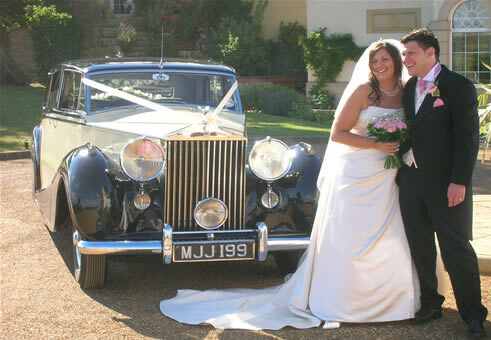 It is simply the perfect choice of wedding cars for hire in High Wycombe and surrounding counties. The Princess and Daimler limousines make an ideal second car.